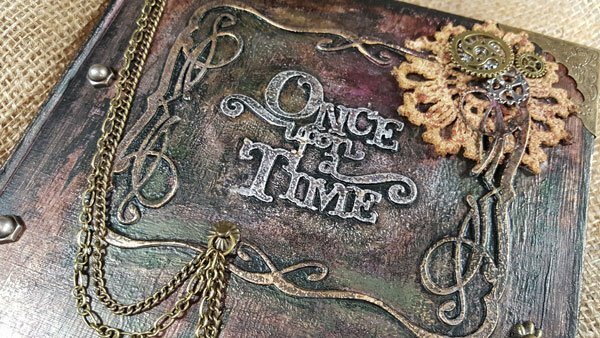 Once all the inks and paint were dry, I began adding a few other embellishments. I started with the bronze page corner protectors (#HD373-B). I then tucked a couple of coffee dyed doilies under corners of the die cuts that I intentionally left unglued. Actually, I only left 2 of the 4 layers of the die cuts unglued…so the doilies were kinda sandwiched in between. 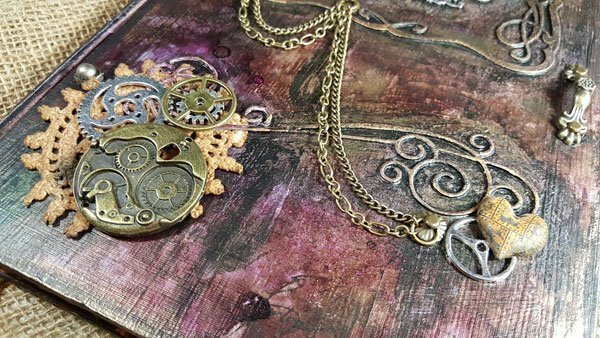 On the bottom left, I opted to layer a large watch mechanism charm with some large, medium and miniature gear charms. I then finished the lower right corner with one small gear charm and a Finnibair heart charm from Prima. 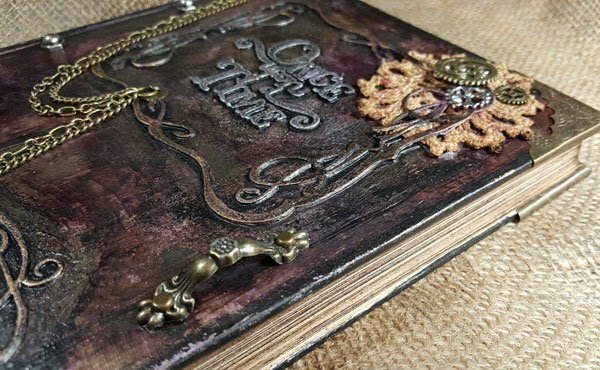 Of course, I needed to add some bronze chain (#CH481-B) to this book, and did so by anchoring the chain in the top left using a jump ring around a Tim Holtz hitch fastener. 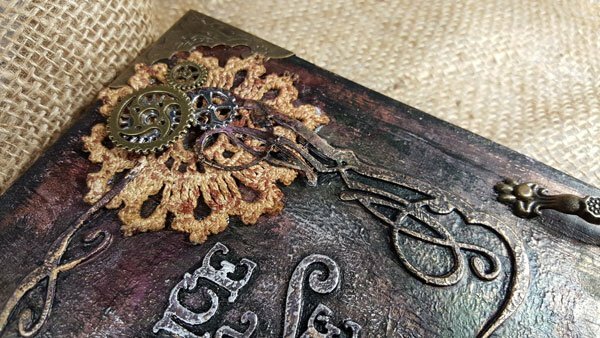 I then added 2 more jump rings to the cover using a brad through a Tim Holtz fluted fastener. 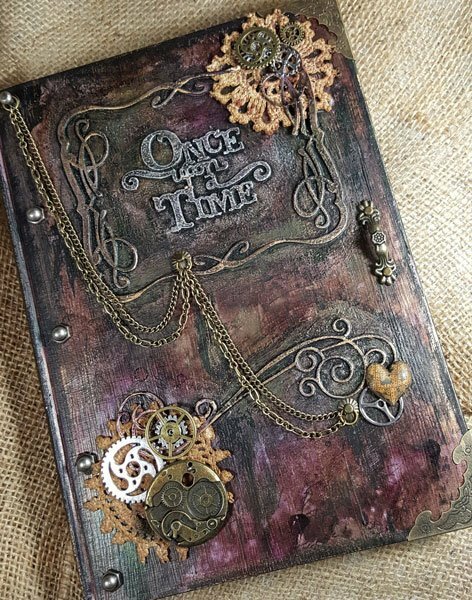 The last finishing touches included adding a small bronze drawer pull (#HD892-B) on the right, a few Prima metal studs (also Finnibair) along the spine, and finally inking the edges of the pages using “Gathered Twigs” Distress ink. 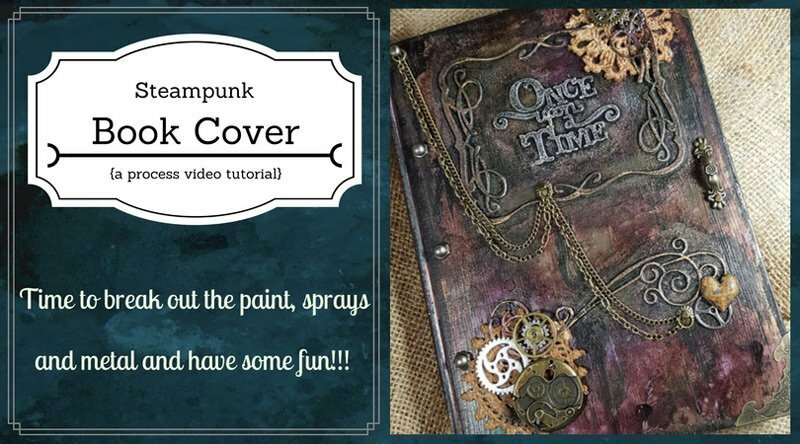 If your interested in seeing exactly how I created this book, along with all the tools I used, you may just want to give this video a view. I have included subtitles throughout so that you know exactly what products and tools I am using. That about does it for this month’s tutorial. I hope you enjoyed it as much as I did making it 🙂 Cheers and thanks for popping by today!